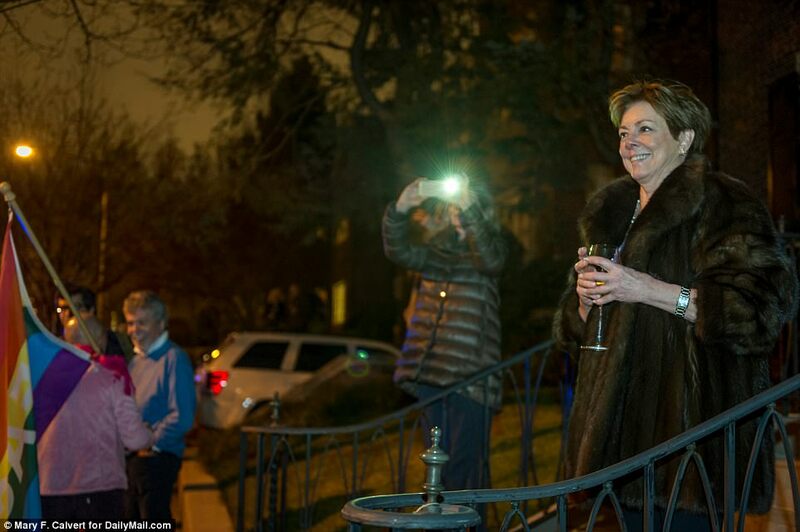 Saturday started out as a typical evening for longtime Washington, D.C. resident Dianne Bruce, who happens to live across the street from Ivanka Trump. She was eating dinner with her husband and her 94-year-old dad when they heard music outside. Naturally, her interest was piqued, so she grabbed her seriously chic fur coat and headed to her front steps to see what had prompted the noise. Someone snapped a photo of Bruce and it immediately went viral — but she’s slightly confused about what the term “viral” means. Along with other neighbors, Bruce and her family watched hundreds of people dance in front of the Trump-Kushner residence in a demonstration that was intended to call attention to the Trump administration’s disturbing climate policies. She describes the scene as a “parade” rather than a protest, and says the neighbors thoroughly enjoyed watching the dancers. One brought out a bottle of wine and glasses — Bruce believes it was a “very nice pinot grigio,” but she’s not entirely sure. Don’t worry — the interviewer explained the definition to Bruce and assured her that she’s safe. Still, she’s perplexed that one photo has made her an Internet sensation. “I don't do tweet. I don't do Facebook. I don't do any of that. I don't really understand it all. It's just one very simple picture,” Bruce explained. The Internet has really taken to this one simple picture and, now that she knows no one will blow up her house, I hope Bruce takes a moment to enjoy her 15 minutes of fame. After all, it is a pretty fabulous photo.